On this page we offer HOLLY YASHI SONOMA COLLECTION JEWELRY at super discounts! The artistic team of Holly Hosterman and Paul "Yashi" Lubitz celebrated their 25th year of Holly Yashi jewelry in 2007! Their work is all about COLOR, and features niobium, with a growing use of glass, crystal and gemstone beads. The niobium is colored by immersion in a saltwater bath, an electrical current changes the color of the metal surface, the color determined by different voltage levels. Most Holly Yashi pieces include layers of color-on-color, as well as surface texture patterns using bright-shiny and sand-blasted matte finish. The jewelry is comfortably lightweight, elegant, flirty, and very well priced to enjoy! This page of Holly Yashi jewelry features their SONOMA Collection, (later became part of the broader MODERN ELEGANCE collection). 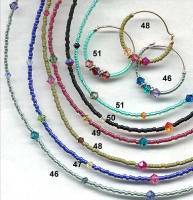 The Sonoma concept evolved from Holly's vision of the Sonoma wine region, exploring color in beading using Czech crystals and glass...hoop earrings, bracelets, anklets and matching necklaces. Holly thought you would want to wear several chains at once to create your own color story! Additions to Sonoma beaded chains for Spring are solid color designs, with multi-colored 4mm Swarovski crystals inserted at regular intervals.